You can go to Everest Base Camp in various ways. You can trek to Everest Base Camp, you can take a mountain flight or even land in the Everest Base Camp in a helicopter. But which of them is the shortest way to reach Everest Base Camp? The shortest way to get to Everest Base Camp depends on how you want to go there. The shortest way to get to Everest Base Camp by trekking will obviously be different from the shortest way to go there in a helicopter. If you are looking to get to mt. Everest Base Camp in the smallest amount of time possible, then taking a helicopter ride might be the one for you. If you are looking to trek there, then the Short Everest Base Camp Trek might be the one you should opt for. Let us take a look at the shortest ways you can get to Everest Base Camp in detail. This is the easiest way to get to Everest Base Camp. A helicopter tour to Everest Base Camp takes you to the Everest Base Camp from Kathmandu in a day and back. This comfortable flight generally takes off to the Base Camp in the morning and you will be back to Kathmandu in the noon. The Helicopter tour to Mount Everest Base Camp has various options. You can either take a private tour or join a group. You also have the facility of regulation of oxygen in the flight so that you won’t have problems of adjusting to the low levels of oxygen in the high altitude of the Mount Everest region. You won’t have to undergo the rigorous amount of preparation needed for trekking to Everest Base Camp. You can enjoy a scenic ride in a helicopter to Kala Patthar, Mount Everest Base Camp, and Everest Hotel View. You will get to see various mountains like Mt. Everest (8,848m), Mt. Pumori(7,156m), Mt. Nuptse(7,864m), Mt. Lhotse(8513m), and Mt Cho Oyu(8,153m). The flights generally take off all year round so you won’t have to worry about the weather. If the flight doesn’t take off, you will be fully refunded. In addition, during the helicopter tour to Mount Everest Base Camp, you can pack lightly. You don’t have to worry about enduring cold for a long period of time unlike trekking to mount Everest Base Camp. The pilots in the Everest Base Camp Helicopter tour are well-experienced. They will also take you to the nearest medical care unit in case of an emergency. The meals that are served during the tour are also great. All of these wonderful things at offer during the Everest Base Camp Helicopter tour makes it a delightful experience. The short Everest Base Camp trek is one of the shortest ways of getting to Everest Base Camp. This trek takes you to the Everest Base Camp in merely 9 days. In these 9 days, you will go to some of the most beautiful villages in the Everest region like Tengboche, Lobuche, and Dingboche. In the short trek to Everest Base Camp, you will also go to Kala Patthar. From this wonderful destination in the Mount Everest Region, you can get great views of mountains like Mt. Everest (8,848m), Mt. Pumori(7,156m), Mt. Nuptse(7,864m), Mt. Lhotse(8513m), and Mt Cho Oyu(8,153m). This destination also gives the most staggering sunrise views you can imagine amidst these mountains. A scenic flight from Kathmandu to Lukla and back. Enjoy gorgeous views of the various mountains of the Mt. Everest region like Everest, Lhotse, Makalu, Cho Oyu etc. You will save a few days of time while getting to mt. Everest Base Camp and back. Scenic Views of mountains from Tengboche. Another quick way to get to Everest Base Camp is the Everest Base Camp Heli Trek. The Heli trek takes merely 9 days to complete. This saves a lot of time and energy for all trekkers who want to enjoy the mountains of the Everest region. The Everest Base Camp Heli Trek starts after a flight from Kathmandu to Lukla. From Lukla, you will go Namche Bazaar and head out to Everest Base Camp. From there, you will also go to Kala Patthar. From there, you will head back to Kathmandu in a helicopter. That will save you all the time and energy needed to track back down to Lukla. This makes the Everest Base Camp Heli Trek a wonderful prospect if you are looking to trek to EBC and save some time. Scenic flight from Kathmandu to Lukla. You will have a comfortable ride to Kathmandu from Everest Base Camp in a helicopter. You will visit the largest monastery in the Khumbu region- Tengboche Monastery. Enjoy the visit to picturesque villages in the Everest region like Dingboche, Lobuche, Gorak Shep etc. 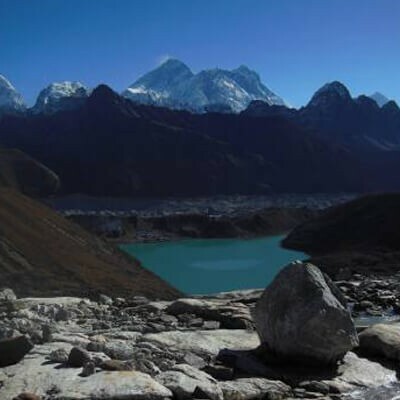 Although Everest Panorama Trek will not take you to Everest Base Camp, it is still a wonderful opportunity to enjoy the beauty of the Everest region in a small amount of time. The Everest Panorama Trek lasts only 9 days long. During this time, you will enjoy the beauty of the places in the lower altitudes of the Everest Region. After taking a flight from Kathmandu to Lukla, you will spend much of your time in Namche Bazaar and Tengboche. These two places offer you chances to appreciate the cultural beauty of the Everest region. You will go to Hotel Everest View- a hotel that once held the Guinness Book of World Record for being located at the highest altitude. This hotel gives you panoramic views of the mountains in the Everest region. Tengboche is another place of tremendous beauty in the Everest Region. It is home to Tengboche Monastery, one of the oldest and largest monasteries of the Everest region. After visiting these two places, you will head back to Lukla for your flight back. A comfortable trek in the low altitude regions of Everest. Visit the capital of Sherpas- Namche Bazaar. The largest monastery in the Everest Region- Tengboche Monastery is home to panoramic views of the mountains in the Everest region. Scenic flights from Kathmandu to Lukla and back. Most people want to get to Everest Base Camp to enjoy astounding views of mountains in the Everest region. But you can enjoy such wonderful views without getting to Everest Base Camp in the Everest Mountain Flight. The mountain flight is your shortest way to enjoy the mountains here. The mountain flight takes off early in the morning when the chances of cloud covering the mountains are the minimum. You will have a bird’s eye view of the Himalayas of the Everest region in this flight. The flight is one hour long and you will be amazed by the mesmeric scenes of mountains like Everest, Cho Oyu, Makalu etc. The Everest Mountain flight is the easiest and the shortest way to enjoy the views of the mountains in the Everest region. Enjoy breathtaking views of mountains, lakes, and glaciers of the Everest region. Get the closest view of the Everest mountains from the air. One hour of comfortable ride amidst the mountains in the Everest region. There are various short ways of reaching the Everest Base Camp. The shortest way is definitely the Everest Base Camp Helicopter Tour. However, if you are a trekker, you can also enjoy the short Everest Base Camp trek or the Everest base Camp Heli trek. You can also go for Everest panorama Trek or Everest Mountain flight to enjoy the beauty of mountains like Everest, Makalu, Lhotse etc. without actually getting to Everest Base Camp. So asses these options and see which of these trips you would like to take.